Low Quantities Produced – Many Destroyed! The 1869 Pictorial stamps were issued in very low quantities in 1869. Due to the stamps’ high face values and controversial designs, sales were sluggish. A large unsold quantity of each stamp was returned to the Postal Department and destroyed, leaving few available for collectors. When the Pictorial stamps were issued, they were considered radical. They were the first US postage stamps to picture something other than the head or bust of a famous leader. And on top of that, they included the world’s first bi-color postage stamps. So it’s easy to see why the Pictorials created quite a stir among stamp enthusiasts. However, reactions to the stamps were mostly negative at the time. It seems the people of the 1860s thought the Pictorial designs were frivolous or improper. In fact, they were so unpopular they were discontinued after only one year because of poor sales. Yet today they’re recognized as the forerunners of modern commemorative stamps and are among the most highly prized of all classic US stamps. Beginning in the 1860s, the government was concerned customers were cleaning and reusing postage stamps. Charles F. Steele invented a device that “grilled” stamps to prevent reuse. This machine utilized a roller that was either pitted with small depressions or with raised pyramids. When such rollers were run over paper, it broke the fibers, leaving a pattern. The broken fibers allowed ink to sink thoroughly into the paper, making ink removal virtually impossible. The National Bank Note Company printed the Series of 1869 because this company held the patent for the grilling process. This made it the only choice available to the Post Office Department. Different shapes or patterns of grills were used during stamp production. Studying grills is an interesting part of our hobby. The various grills used on US postage stamps are identified by letter names. All of the 1869 Pictorials feature the “G” grill – they are the only stamps to do so. For those collectors who specialize in collecting grilled stamps, US #120, 121, and 122 are essential additions to their collections. This creates even greater demand for these already scarce stamps. US #120 – The 1869 Declaration of Independence Pictorial is based on John Trumbull’s large painting of the presentation of the Declaration to the Second Continental Congress. It pictures 42 of the men who signed the document. The stamp’s vignette (central design) was engraved by James Smillie and is considered to be one of the finest examples of the engraver’s art. Six Founding Fathers can be identified with the help of a magnifying glass – even though their faces are smaller than the head of a pin! US #121 – This was the first stamp to carry what has become a popular US stamp design element – the American flag. So in addition to it being a forerunner to modern commemoratives as part of the Pictorials, US #121 is also the forerunner to all modern flag stamps. The most likely use for this 30¢ stamp was to send heavy parcels to France and other parts of Europe. When you add US #121 to your collection, you’ll probably own a stamp that carried a package overseas. US #122 – Just 55,000 of this stamp was issued – and less than half that were actually sold. The rest were destroyed. 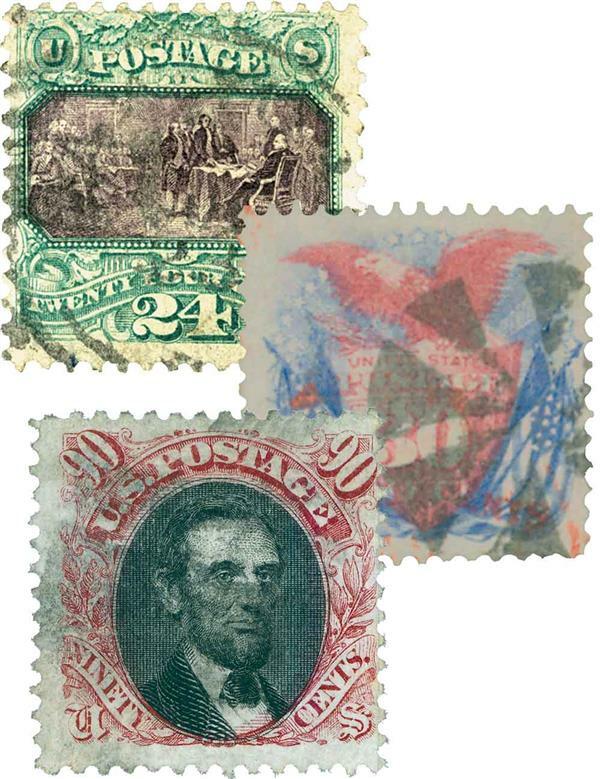 It’s estimated that no more than 5,250 Lincoln Pictorial stamps exist today in any condition. That may seem like a high number, but when you realize current stamp quantities often reach into the billions, this figure becomes significant. Not many collectors can own this stamp today – but you can get all three in one convenient order.